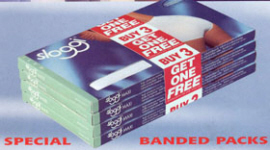 A Range Of Popular Sloggi Briefs In Multi Packs, All With Special Offers. SLOGGI MAXI BRIEF OFFER. BUY 3 GET 1 FREE. SLOGGI BASIC MIDI BRIEF OFFER. BUY 3 GET 1 FREE. SLOGGI BASIC TAI OFFER. BUY 3 GET 1 FREE WHITE ONLY. SLOGGI BASIC TAI OFFER. BUY 3 GET 1 FREE. POUDRE AND BLACK . AS LISTED ONLY. LIMITED QUANTITIES LEFT. SPECIAL SLOGGI CONTROL MAXI, TWIN PACK. WHITE. POUDRE & BLACK ONLY. SPECIAL SLOGGI CONTROL TAI BRIEF, TWIN PACK. SLOGGI 100 TAI SPECIAL OFFER. SLOGGI BASIC MAXI BRIEF OFFER. 3 PACK. WHITE, POUDRE & BLACK ONLY.